Please select an option 14k white gold 14k rose gold 14k yellow gold Please select a gemcolor. Please select an option 4.5 5 5.5 6 6.5 7 8.5 9 7.5 10 9.5 10.5 8 Please select a ringsize. Set in 14K Rose Gold, this bright rose ruby ring is embedded with petite moissanite stones that sparkle with maximum brilliance too. Ruby is the stone of detoxification and grounding. It eliminates the negativity and toxins from the body. Besides its gorgeous red dazzle, this ring is set in a floral pattern with shimmering moissanite that accents your fingers. It is best as casual everyday wear and the best accessory for winning your date night outta town. Ruby is a high energy stone which is a type of sapphire. It is used to amplify energy and increase chi or prana. It is also a stone that may bring a sense of adventure and leadership. Wearing a ruby ring can protect you as it creates a cocoon over your aura of base chakra energy. You will find yourself energetic, positive and enthusiastic after wearing this floral gold ruby ring. How to Clean your 14k Yellow Gold Ruby Ring? 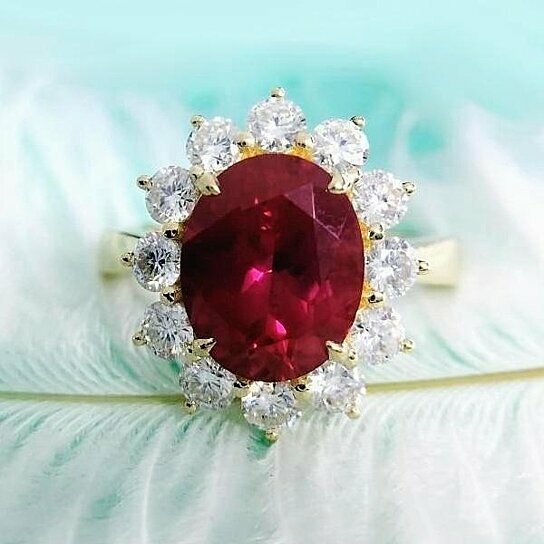 Usually, gold is cleaned with any normal detergent, but when you have ruby embedded in the ring, it is best to keep it away from water. Ruby contains aluminum and the best way to clean it is dry. Take a cotton ball or soft bristle brush. Scrub the ring gently from all the corners.